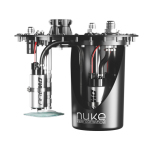 The Nuke Performance CFC Unit : Competition Fuel Cell Unit. A fuel cell fill plate replacement with integrated fuel surge tank function. For more information about the CFC Unit - go here for a guide of how it works! This is a 24 bolt fuel cell fill plate replacement that contains a built in Fuel Surge Tank for single or dual internal fuel pumps, such as DW300, DW400, Walbro GST450, Walbro GST 520 etc. 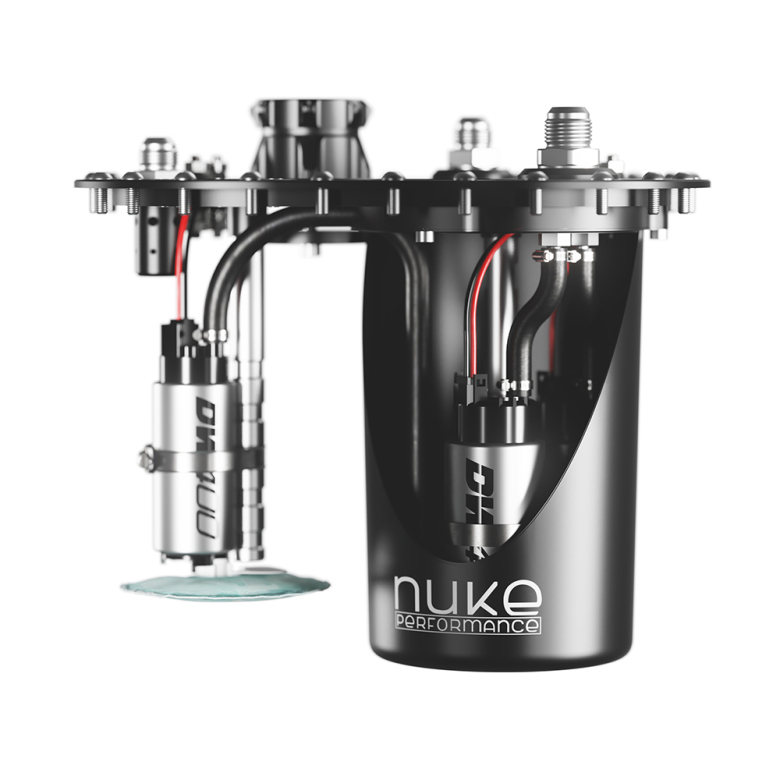 The Nuke Performance "Competition Fuel Cell Unit", the CFC Unit is a fill plate replacement for fuel cells from market leading manufactures including ATL, FuelSafe, Jaz, Harmon, Pyrotect and several others. It has a 6*10" design with the standardized 24 bolt pattern to fit most manufacturers fuel cells. Combine the two internal fuel pumps into one 7/8 AN -8 / AN-10 outlet, both fittings are included. This Fuel Surge Tank is able to deliver steady fuel flow even over 1400hp. 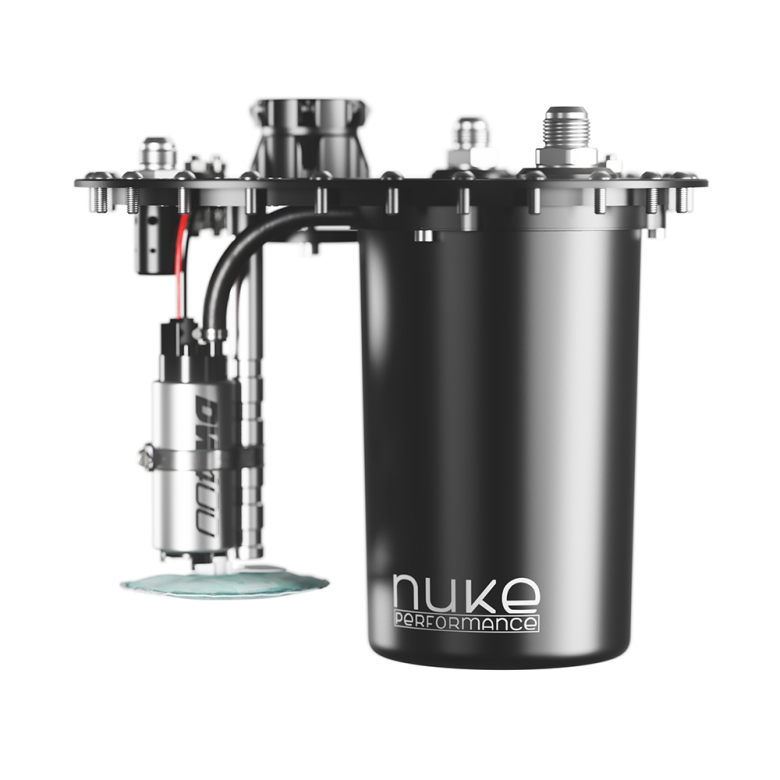 The Nuke Performance CFC Unit is made to be a replacement unit for the 24 bolt pattern fuel cell fill plate, it gives you a light weight and space efficient installation with minimum fuel piping and a easy-to-use setup. The well known electrical connectors makes it possible to choose from almost any pickup fuel pump and within the Swirl Pot we have our well known billet bracket, but in this unit you get both the bracket for 39mm fuel pumps aswell as the bigger one for DW400. With our Fuel Surge Tank function of the CFC Unit, you minimize the risk when running at low fuel level, that the system not cope with the extremely hard driving such as drifting, drag racing and track days where you can exceed 2g, which could result in fuel loss. 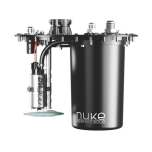 The Fuel Surge Tank unit works as a buffer so the fuel pumps are always supplied with fuel for high outputs. Delivered with everything you need for a 1+1 or a 1+2 fuel pump installation and with both AN-8 and AN-10 fitting for the fuel line. It also comes with a AN-6 fitting with roll-over valve for ventilation. • FST Unit holds a volume of approximately 2 liters. • Delivered with 1x 3/4 AN-6 vent fitting 1 x 3/4 AN-8, 1 x 7/8 AN-8 fitting and 1 x 7/8 AN-10 fitting. • 7/8 UNF Port, available to AN-8, AN-10, AN-12 line. • Billet aluminium 6*10" plate with standard 24 bolt pattern. • All fittings and washers you need are included.